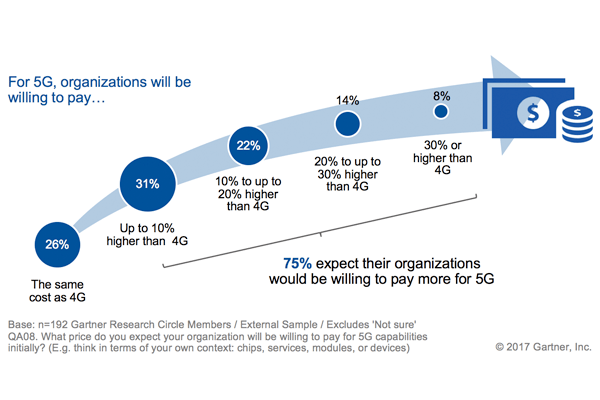 A recent global Gartner survey* revealed that 75 percent of end-user organizations would be willing to pay more for 5G mobile capabilities (see Figure 1). Only 24 percent of the survey's respondents would be unwilling to pay more for 5G than for 4G. "Those in the telecom industry are more likely to be prepared to pay more than those in other industries," said Sylvain Fabre,research director at Gartner. "End-user organisations in the manufacturing, services and government sectors, for example, are less likely to be willing to pay a premium for 5G than telecom companies, which are willing to pay a 5G premium for their internal use." Figure 1: How Much More Are End-User Organisations Willing to Pay for 5G Capabilities? In addition to offering better prices for industries in which users are less convinced of the business benefits of 5G, communications service providers (CSPs) must create value propositions that entice customers to start 5G migration projects sooner. Although most of the respondents think their organizations would be prepared to pay more for 5G, few (8 percent) expect 5G to deliver cost savings or increase revenues. 5G is seen principally as a network evolution (59 percent), and only secondarily as an enabler of digital business (37 percent). The survey also found that respondents from the telecom sector are less persuaded than those in other industries that 5G will be a revenue enhancer. "They tend to see 5G migration as a matter of gradual and inevitable infrastructural change, rather than as an opportunity to generate new revenue," said Mr. Fabre. The survey found that almost half the respondents intend to use 5G to access videos and fixed wireless capabilities. More interestingly, though, the majority respondents (57 percent) believe that their organization’s main intention is to use 5G to drive Internet of Things (IoT) communication. "This finding is surprising, as the number of deployed 'things' that need cellular connectivity won't exceed the capacity of existing cellular IoT technologies before 2023 in most regions," said Mr. Fabre. "And even once fully implemented, 5G will suit only a narrow subset of IoT use cases that require a combination of very high data rates and very low latency. In addition, 5G won't be ready to support massive machine-type communications, or ultra-reliable and low-latency communications, until early 2020." This finding may also be a sign of confusion about 5G's applicability, as many proven and less expensive alternatives already exist for wireless IoT connectivity — use of Wi-Fi, ZigBee or Bluetooth, for example, would avoid the cost and complexity associated with cellular communications. A degree of misunderstanding is probably also apparent in the expressed belief by a large majority of the respondents (84 percent) that 5G will be widely available by 2020. By contrast, CSPs' plans indicate that wide availability may not be achieved before 2022. Gartner predicts that, by 2020, only 3 percentof the world's network-owning mobile CSPs will have launched 5G networks commercially. "Although standards-compliant commercial network equipment could be available by 2019, commercial rollouts of 5G networks and services by CSPs before 2019 are likely to use prestandard equipment," added Mr. Fabre. CSPs' marketing organizations need realistic roadmaps for 5G coverage and typical performance, so that they communicate with customers accurately. They also need to publish clear 5G rollout plans for the years 2019 to 2021 to help innovators understand when and where 5G will be available for IoT applications. Additional analysis is available in the report: "User Confusion About5GDemands CSP Action." Over 200 IT and business leaders from the Gartner Research Circle participated in a survey conducted in the second quarter of 2017. The objective of the survey was to understand how demand for 5G is growing and to learn about adoption plans for this technology.